Review: The First Purge (2018) Taps Into Current Socio-Political Climate To Give Us the ‘Black Mirror’ Version of the U.S. The fourth installment in James Demonaco’s Purge universe gives us a sci-fi alternate version of the U.S. that rings a little too close to home. By far, one of my favorite aspects of the continuing saga that is Blumhouse’s ‘The Purge’ movie universe is how readily writer James Demonaco’s films jump genre from installment to installment. The Purge was a home invasion thriller, The Purge: Anarchy was a siege film in the mold of Assault on Precint 13, The Purge: Election Year was a straight-up horror film and 2018’s The First Purge is 1/2 science fiction meets 1/2 blacksploitation action piece. The best part is, it works. Director Gerald McMurray, taking the director’s reigns from Demonaco while Demonaco scripts the proceedings, channels cult favorites like The Warriors, Trouble Man, The Raid, Escape From New York and Die Hard to craft an engaging action climax for the second half of the film. The First Purge centers heavily on the circumstances that led to the Purge films New Founding Fathers of America coming to power and how The Purge initially came to be. In an opening montage peppered with scenes from the news of today, Demonaco and McMurray heavily insinute that disaffected American fringe groups analogous to the Alt-Right rose up anf formed the NFFA after the Democrats and Republicans lost the will of the majority and a presidency not unlike the one today sent the country into a depression that led to the NFFA capturing the White House. The Staten Island Experiment, as it is known, is the first iteration of what comes to be The Purge, as Staten Island is chosen to be the test site for the idea of a 12 hour period of open lawlessness to cleanse the American Spirit. People are paid to stay and participate, much to the protests of groups like those led by Nya (Lex Scott Davis), who see The Purge as institutionalized murder on the poor, minority, working class of Staten Island. Others, like Dmitri (Y’Lan Noel), disagree with The Purge for the effect on the community; he’s a drug dealer and gang leader who sees the disruptive effect The Purge will have on his community and ecosystem. As The Purge gets underway, Dr. Updale (Marisa Tomei), the architect behind the experiment notes participation is not what was expected; which prompts the NFAA to jump into action and many of the film series’ tropes are explained by the actions they take. Meanwhile, Nya and her brother Isaiah (Joivan Wade) try to make their way to safety in this madness as Dmitri takes a stand to defend his neighborhood from the mercenary aspect in humanity that The Purge creates. As far as being the 4th film in the franchise, The First Purge stands on its own merits; you don’t need to have seen any previous films in the series to get the conceit. The film is much more effective in its second half when it becomes a blacksploitation driven action film in the vein of films like Trouble Man and doing its own take on siege films and genre gang films. The cast is mostly unknowns but Y’Lan Noel shines as Dmitri and he definitely needs to be cast in more genre fare. He plays the conflicted protagonist role well and gives the series a nice break from the white savior role Frank Grillo’s character played in the last 2 Purge films. The film is thick with social commentary, including one scene that is a direct shot at our current President. That being said, the film would work better if it didn’t tow the line as much as it does and some direct commentary ala Black Mirror would elevate this film tremendously. That being said, the film does end with an advertisement for the USA Network’s 10 episode The Purge limited series event, so hopefully some of the bile and commentary was saved for that endeavor. 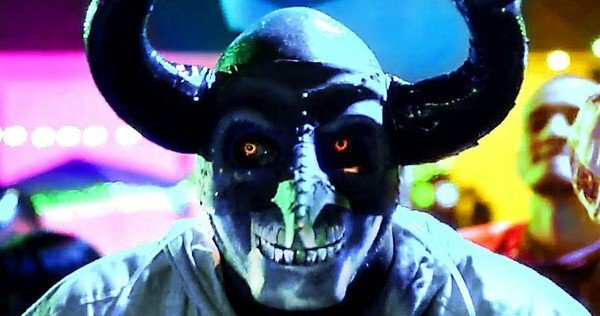 In the end, The First Purge is a solid entry in the series’ canon, albeit one that could have a bit more bite.